Lipstick is arguably the most iconic makeup implement of all. Who can deny its glamorous connotation, either in-tube or applied onto the kisser of a starlet? The cosmetic has been portrayed as a veritable character all its own in several cinema titles spanning several decades. Here, a breakdown of some of our favorite scenes where lipstick steals the show. Adrenaline-shot recipient Mia Wallace, played by Uma Thurman, changed the lipstick and lacquer landscape of the ‘90s. Few other movie characters can claim such an impact--and especially during such a patently unchic time when fashion and beauty were left to draw inspiration from the emerging Seattle music scene as many major influencers in fashion at this time were tragically dying of AIDS. Her sleek dusky bob, her smokily lined eyes and quirky locutions like “I’ll be down in two shakes of a lamb’s tail” positively empowered all of us to delve into decadent deep shades and launched the insanely popular Chanel “Rouge Noir,” later renamed Vamp. It was created to mirror the hue of dried blood and its first year alone sales grew to $1 million. To the casual movie buff, Mia Wallace recalls a Willow filter take on Scarface’s Elvira Hancock in both personality and looks. But did Elvira spawn two eras of glampire beauty moments, spanning 15 years? Mia Wallace also schooled us on the prevalence Beatles vs. Elvis people. One cannot claim both. It’s vital that you understand this. My first horror movie: I first saw this at a sleepover party when I was nine and it continues to haunt me. Possibly the creepiest scary movie villain in LIFE, Buffalo Bill is too disturbed to qualify for gender reassignment, per his wishes, so he takes it upon himself to create a “woman suit.” In a sinister scene, he listens to Q Lazzarus’ “Goodbye Horses,” applies makeup and dons a “skin skirt” procured from a teenage girl and professes self-love in the weirdest voice known to man, all while Precious, his white Bichon Frisé is kidnapped by his latest victim. Buffalo Bill was the original beauty YouTuber, lest you forget. The quintessentially ‘80s flick The Secret Of My Success features an iconic lipstick scene courtesy of one Mrs. Christy Wills, a financial phenom and Harvard alumna. Michael J. Fox’s character, Brantley Foster, makes her acquaintance in this scene when he drives her home in a company limo (at his employer’s request). They begin having an affair and who can argue that its inception wasn’t at the exact moment she applied her shimmery pink Estee Lauder tube to the tune of “Oh Yeah” by Yello, already popular from Ferris Bueller’s Day Off? It is a truth universally acknowledged: Everyone likes to pace during long phone catch-ups and everyone likes Jessica Rabbit. Perhaps the sultriest cartoon character ever to be sketched, Jessica’s not bad, she’s just drawn that way. Here, she applies her signature red lipstick while talking to diminutive detective Eddie Valiant. Fun fact: Jessica Rabbit may have been inspired by Veronica Lake, but her prototype was also derived from backless party-dress wearing/Hollywood party-crashing Vikki Dougan’s. In perhaps the most famous cinematic homage to maquillage, Molly Ringwald’s Claire Standish performs a party trick during a Saturday detention at her high school’s library. (“It’s so absurd I have to be here on a Saturday.”) The sushi guru and Moliere maven may have been saddled with a fat girl name, but her hands-free lipstick trick impresses all of the Breakfast Clubbers--even John Bender, though he doesn’t admit it until the end of the flick, before Claire gifts him with one of her Daddy-donated diamonds. True story: I once endured the high school horror that is a Saturday detention as punishment for a Wawa visit when I was supposed to be in Oceanography class. It was significantly less tragic for me because I donned a pink V-neck a la Claire and read French poems by Baudelaire, a nascent obsession that later led to a degree in French literature. If only we could ever hear the punchline to that joke John Bender is in the middle of telling when he crashes through the ceiling. That torn dress. That vanity! Liz Taylor’s character Gloria Wandrous wakes up in wealthy businessman Weston Liggett’s apartment and finds that he’s left her money. Insulted, Gloria dons Liggett’s wife’s fur coat and draws a message on the bathroom mirror. 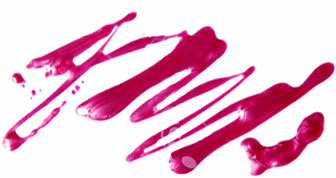 “No sale,” scribbled in living Metrocolor remains etched in my mind as a PIVOTAL lipstick moment. It’s all golden. The ‘80s and all its shoulder-padded splendour at a Manhattan department store. A beauty counter. Miss Piggy’s sneer. Joan Rivers’ use of her signature phrase “Can we talk?” A flurry of foundation, a precipitation of powder and, of course, a lavish allocation of lipstick. The pair gets fired in the end, but this remains the most maniacal makeup scene in movie history. There are actually two major lipstick moments in this flick. First, Holly Golightly has converted her mailbox by her apartment building’s front door into a mini vanity, complete with a mirror, lipstick and perfume. Mail? Who needs it? If I weren’t such a goody goody, I’d be coming and going in a glamorous whirl, all while maintaining my written correspondence. Second, Holly tells Paul Fred that “a girl can’t read that sort of thing without her lipstick” in the car. The Rolling Stones may have had the mouth monopoly, but one could say that Rocky Horror Picture Show is practically archetypal when it comes to lips. The film’s opening song, “Science Fiction Double Feature” is sung by Richard O’Brien, and lip-synced by Patricia Quinn’s disembodied red-lipstick adorned lips. Rouge lips also made a cameo on the film’s poster. *Read more of Amber Katz's work on her blog, Beauty Blogging Junkie. Check out the flicks that made our list of most iconic hair moments in movie history here.